Discussion in 'Life and Other Topics' started by CodeExia, Jan 27, 2017. There are a lot of casinos all over the world but some or them are really unusual. I'm interested in a casino theme, and I always read with great interest about the unusual casinos and try to visit em all. So here is my TOP-5. 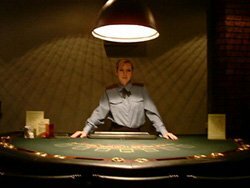 The most strange casino that I have been to was "Kolyma" in Russia, Saint-Petersburg, around 10 years ago. As you may know, originaly "Kolyma" is the place in Russian Siberia, where in times of Gulag convicts were exiled. So it might be one of the most terrible places in the world. The casino was decorated with different cages, irons and prison photos. Dealers and other employees were dressed in police uniform and there was a special russian music (I do not know how is it named) that is very popular among criminals in Russia. Singapore has long been a best leisure place for expats and westerners seeking rest and relaxation in Southeast Asia. One casino looks uniqe. The Marina Bay Sands, one of the first of two casino resorts ever built in Singapore. Constructed to appear like a deck of cards, this casino has three tower stacks that lean out of the bay to create quite a striking look on the skyline. Amsterdam is well known for its liberal attitude. As I know there are few casinos placed in airport terminals in the world, but this one is only one where I have been myself. Holland Casino is pretty popular among people looking to while away a bit of time by taking a chance waiting for their flight to depart. Coober Pedy, Australia. Desert Cave Hotel is one unique and strangely weird casino option for the adventurous traveller out there. It is the heart of the Australian outback, not far from the opal mines that provide underground relief from the baking sun. Desert Cave Hotel is popular not only among tourists but also among miners living in nearby underground dugouts. Prague, capital of the Czech Republic, is home to the interesting Casino Palais Savarin. First built in the 18th century, the Casino Palais was renovated more extensively in the late 20th century to fit the famous Baroque style that a lot of Prague takes pride in. Inside the casino itself you get to scale a massive staircase while looking overhead at frescoes and pretending as if you’re in one of the world’s most ornate classical art galleries on your way to the slots. And what unusual casinos did you ever visit? Thank you for writing that, interesting reading! Why did you go to Russia? I have been to casino in Venice, Italy. It is the oldest casino in the world that is still working. It was opened 400 years ago in a 500 years old building. Are you sure that first photo from Kolyma is real? There is Stalin at the flag, it might be illegal in Russia our days. 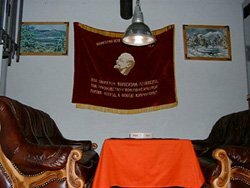 There is Stalin at the flag, it might be illegal in Russia our days. That is Lenin, not Stalin. And it is legal in Russia to use communist's symbolism. I have been to casino placed underground in a tube. Somwhere in Eastern Europe I guess. I have never been to Saint-Petersburg but I have been to Moscow like 15 years ago. I wondered how much casinos there were underground, I think at each metro station. But there were only slot machines, no any live dealer table. Nope, not Saint-Petersburg, I have never been to Russia.